When I started this blog project almost two years ago, I hadn’t considered what I would investigate after I finished reading the Bible. To be honest, I didn’t really think I would even continue this project after that. However, books keep finding me, ones that have a point of view to add to the conversation about religion in general and, more specifically, how religion (and thoughts about religion) impacts sexuality (specifically members of the LGBTQ community). My list of these books keeps growing, and part of how it grows happens as a result of people hearing about this project and recommending titles for me to consider. Every book thus far (I’ve only read a few at this point) presents a different piece of the picture related to the intersection of religion and sexuality. Each has shed light on this issue: why is the Bible (still) used to justify an anti-homosexual stance so often? 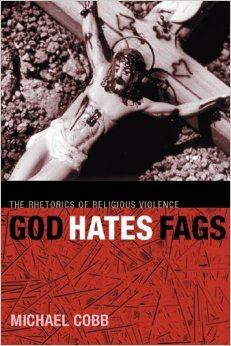 The next book on my desk is the one with the most confrontational title: Michael Cobb’s God Hates Fags: The Rhetoric of Religious Violence. Rather than promote the thinking behind the hateful expression adopted by the hate-group The Westboro “Church,” this book—as per the introduction—begins with a premise: “What contemporary, anti-homosexual jeremiads* signal, among other things, is that gay, lesbian, bisexual, and trans politics must be concerned with the rhetorical force of religion” (8). Although Cobb examines this point in general, his examination of the topic focuses on how this type of rhetoric belong to “primarily conservative forms of Christianity in the US” (10). Although I can see why he would believe this—and I do think that the anti-gay agenda is mostly pushed by this slice of Christianity—I am curious to see how he handles the fact that recent ballot measures (like California’s Prop 8) have been passed by a majority not comprised of this group. So clearly their influence extends far beyond their membership. Most interesting thus far is the way he discusses how, when confronted with this type of hate speech, the gay community often uses a race analogy to “describe our queerness”(15)—positioned as attacked victims, we align ourselves with those who have suffered (and continue to suffer) at the hands of racist beliefs. As he contends, in order to best convey our feelings, we need a “borrowed language of racial injury and violence” (18). Although he understands why we’ve done this, he suggests that this strategy is flawed (for reasons he develops in the book). As someone who has used this analogy in my own discussions and writing, I’m curious how this unfolds—at the moment, I’m rather intrigued about what this can teach me. The book has four chapters plus a conclusion. Over the course of the next five posts, I’m going to interact with his ideas and pass on how these inform my developing, ever-increasing sense of religion, how it’s used, and how the members of my LGBT community needs to respond. I continue to believe that a small religious minority is twisting what they read and giving a bad reputation to a text that has the potential to offer a lot of good: The Bible. This entry was posted in Michael Cobb's God Hates Fags and tagged Brad Windhauser, God Hates Fags, Michael Cobb, Religious Rhetoric. Bookmark the permalink.